If you’re looking for a great way to spend one day in Galway, look no further — I took a trip there in early January and the following would be my suggested itinerary. After getting up, find a traditional Irish restaurant for some breakfast. 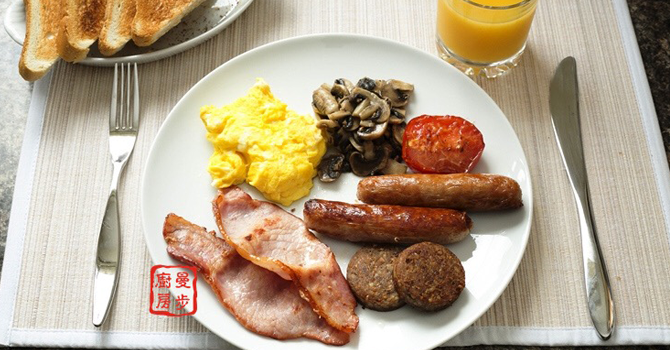 A full Irish breakfast is a fabulous way to start a lovely day, typically including bacon rashers, pork sausages, fried eggs (or scrambled), white pudding, black pudding, toast and a beverage such as coffee or tea. It takes more time than having a sandwich but I can guarantee that you won’t regret it. It’s a good idea to take a walk after your nutritious breakfast. Salthill is a great place to go for a walk, either alone or with family. There are always plenty of people walking along the coast, having fun with their friends or walking their dogs. It’s such a great place to enjoy some quality time with our families and friends. Another excellent adventure would be diving or swimming in the sea. 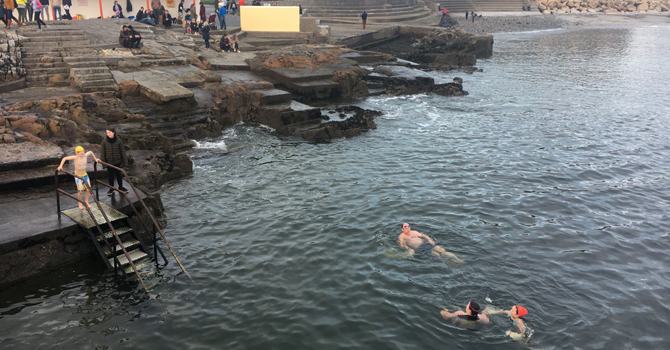 It was so cold when I was there, especially with the wind but there were not only adults, but also children diving and swimming in the sea. I would like to try it next time as swimming calms me down and I find it relaxing to watch the tides and feel the sea wind. I think you would also like it. Walking for two or three hours along the coast will consume a lot energy so it’s a good time to have some lunch. As we’re in Ireland, what could be better idea than having some Irish lamb or beef stew with mashed potatoes? If you are feeling very hungry, have a starter before the main course — I would recommend some sea food, especially salmon. We all know that Claddagh ring is an important part in Irish culture — it means; “With my hands I give you my heart, and crown it with my love”. Do you know that the Claddagh ring was actually first made in Galway? And there are so many different stories about the ring. So why not buy a ring for your love or your friend as a great gift? Going around the city centre and finding your own Claddagh ring would be a great way to spend the afternoon. There is also a Claddagh ring museum in the city centre if you are interested. Alternatively, you could go to some shops in the city centre to look for a real Irish woollen sweater, which are warm and cosy like a soft blanket. There are also plenty of souvenirs worth buying if you walk around the shops. Now that you will have almost digested your lunch, it’s a good time to have some afternoon tea. I highly recommend a place called “Cupán Tae” but it is quite pricy for what’s on offer. 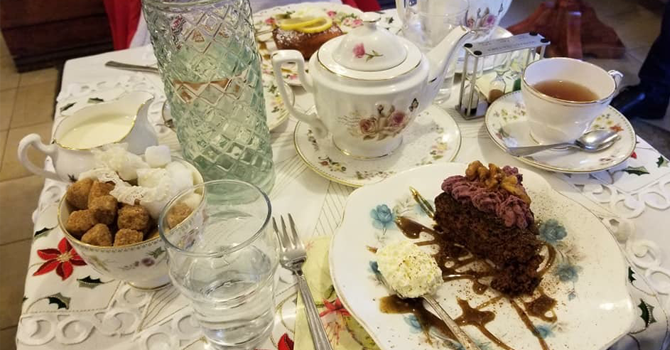 Sitting down and having a chat with friends or family is always better with some tea or coffee, alongside with some really delicious desserts. Personally, I would choose the Lemon cake. How could we enjoy a trip in Ireland without having a small drink? 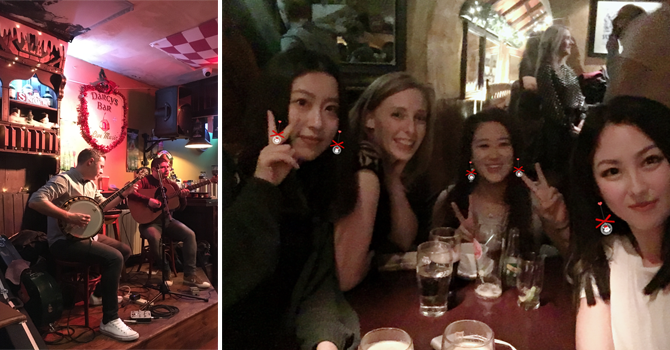 So after a long day, the best place to go would be an Irish bar, where you can not only have the famous Guinness, but also enjoy live music. If you’re like me and don’t like stouts, there are lots of other choices too, such as gin, Irish whiskey and cocktails. If you want some recommendations for the bars, I would suggest The Front Door, The Quays and The King’s Head which are all good choices. Would you spend your day like this? Let me know if you are also interested in travelling around in the comments below.